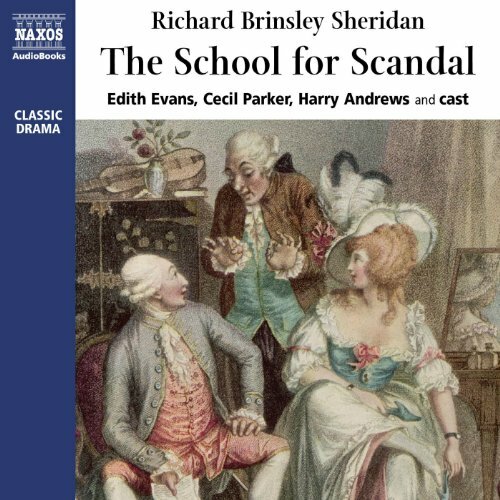 Richard Sheridan's subversive 18th-century comedy of manners School for Scandal comes thoroughly to life in this entrancing audiobook thanks to incandescent performances from Edith Evans, Harry Andrews, and Cecil Parker. These skilled voice actors adeptly draw out the humor of this satirical work, hamming up their performances and fully inhabiting their characters, guiding listeners effortlessly through the twists and turns of this complex and convoluted play. Evans, Andrews, and Parker produce performances so distinctive as to render confusion nearly impossible; indeed, listeners will find themselves wholly drawn into this world of salacious secrets, threats, and gossip, entranced by the plot of this captivating work as it unfolds. Sheridan's most famous play, The School for Scandal, has been called "the best existing English comedy of intrigue". A favourite with audiences and critics alike since its premiere in 1777, this play is a classic English comedy of manners. Full of satirical wit, it subverts the Georgian social mores of its day with subtlety and charm. This historic recording features Edith Evans, Cecil Parker and Harry Andrews: Some of the finest actors of their generation.